Several years ago, I inherited the papers of Iva Belle (Moore) Tucker, a woman who grew up in a family of ranch hands working in the Texas Panhandle. In contrast of her siblings, who did not like to reflect on the hardships they endured, Iva felt it was important to document the people and experiences that shaped her life. Even better, that documentation extended to the many photographs in her possession. Having been entrusted with these papers, I feel a sense of responsibility to use my own talents to further her narratives and produce some body of work that ensures that her own family, at least, remembers the history of a small group of ranch hands during the vanishing heydays of the cowboy. 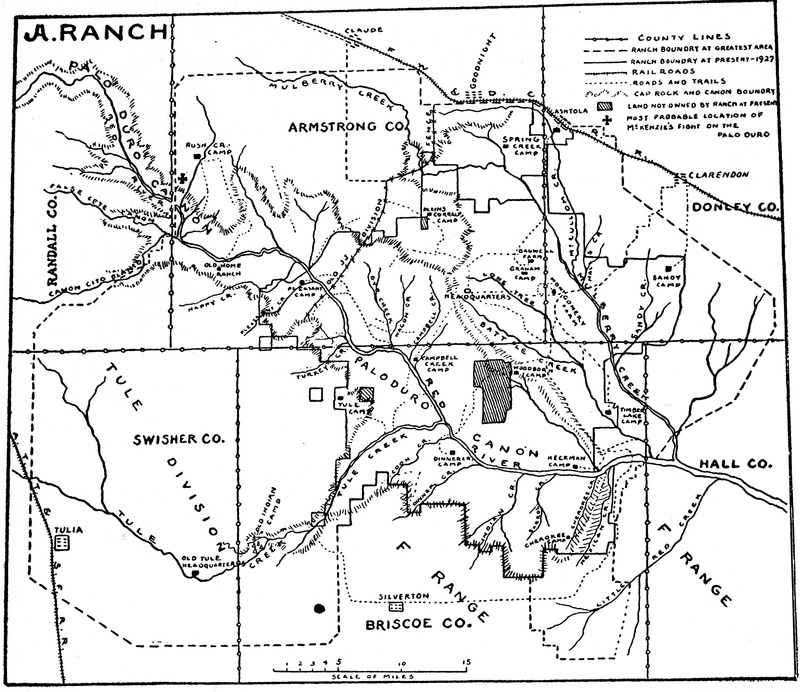 Map of the JA Ranch, original boundaries. Undated; source unknown. Downloaded from http://www.ranches.org/ja-ranch.htm, 29 Sep 2015. The JA Ranch once encompassed over 1.3 million acres of West Texas land. It was founded by Charles Goodnight, in partnership with John Adair. Their friendship is often believed to be a loose basis for the book Lonesome Dove, though the author disputes that. Tom Blasingham, a famous cowboy, worked on the ranch during the period. Bob Wills (The Texas Playboys) was another acquaintance. Iva knew none of them as famous personages – they slip in and out of her narrative as part of the circle of family and friends. For this project, I want to focus on the ranch during the period Iva lived on it (1915-1923). I’m still uncertain as to whether I can pull together enough information in the time left in this semester to focus solely on those years. If I can’t, my strategy is to pull in some contextual information that helps to frame the conditions of that period. This week’s text, Placing History, has a couple of case studies (husbandry and the Dust Bowl) that I think will be useful for helping me to get my arms around this project. Texas: A Historical Atlas by A. Ray Stephens, 2012. Dazzling and full of useful information about the overall history of the Texas panhandle. A History of the JA Ranch, by Harley True Burton, 1927. Still considered the definitive history of the ranch. The ONLY book length history of the ranch. The Importance of Collecting Histories of Texas Ranches, by Lawrence Clayton, Journal of American Culture, 1 June 1994. Explains the reticence of many ranchers regarding such projects. Southwest Collection/Special Collections Library, Texas Tech University. 205 linear feet of JA Ranch records. Not something I can access for this project, but definitely a place to go in the future. JA Ranch Records at the Panhandle-Plains Historical Museum Research Center. Another 100 feet of records. I need to move to Texas. Updated to add: Joshua followed up on last week’s discussion and started a list of questions to ask about a map; it’s the kind of post that could take on a life of its own if he keeps adding more detail I offered a few suggestion. Dale is feeling betrayed, but I think he’s recovering. I answered his question about linking to comments. Michael is talking about the LA Times use of mapping to visualize data. Like me, April is looking for ways to focus her project in a way that is achievable for a semester project – I offered a few ideas. Next A Cartographic Earwig: Is This The Way To Amarillo? While I feel no need to move there, a trip or two to Texas would be interesting. Iva’s brother Oscar (Uncle Bill) never got ranching out of his system and ranched until less than a week before he died. Would have been longer but it was being thrown from his horse that did him in. Iva’s dad cowboyed until he got too old for it. They had to put him on the Chuck Wagon because he wouldn’t give it up. This sounds like a fascinating topic for a project in this class. I especially like how you are using maps and spatial evidence in the service of a historical narrative, how things change over time, the movements of people and the forces that move them. Really interesting and really smart.